contriving to vilify and stigmatize him. In a statement on Friday, Amaechi, who governed Rivers between 2007 and 2015, alleged that the duo are plotting to use his former cabinet members to tell fake, concocted and distorted stories in the media. He said the plot is already far-gone and persons are been coached on what to say and how to say it. “I am aware that two former commissioners who served in the State Executive Council when I was governor have been procured by Wike and Abe, jointly and collaboratively, to carry out this hatchet job of ‘hack Amaechi down’ campaign. The plan is to throw as much dirt at me as possible and rubbish my image,” he said. “While one is been coached in Rivers State Government House of what to say to the Press and how to say it, to do maximum damage; the other one is busy distorting, concocting and fabricating fake screenshots, text messages, documents and all sorts in Senator Abe’s Freedom House campaign office in Port Harcourt. 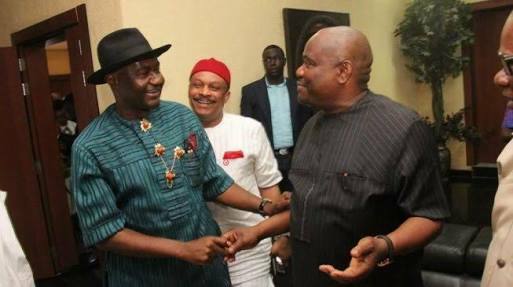 Amaechi vowed not to be distracted by the campaign of calumny against him, urging people of the state to “pay no heed to the desperate attention-seeking duo of Wike and Abe and all of their fabricated lies, but focus on the goal of ensuring that Rivers State gets a better leader that would turn around the fortune of the State and its people for good, come 2019”.